In this post we will learn about how to use Spring Batch to read multiple flat files using MultiResourceItemReader and write to database with Hibernate (using HibernateItemWriter). We will also witness the usage of JobExecutionListener and itemProcessor. Let’s get going. What we will do here is read multiple files from src/main/resources/csv/*.txt and write in MySQL database using Hibernate. Create a fairly simple table in MySQL database which maps to our domain model. 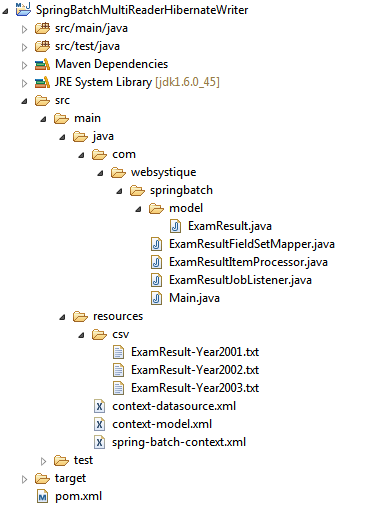 Below is the content of flat files /src/main/resources/csv/*.txt which will be inserted into database using hibernate. Now let’s add all contents mentioned in project structure in step 1. Since we are using Hibernate this time, we’ve included hibernate-core dependency. We will be using a pooled data source ComboPooledDataSource. We also need mysql-connector-java to connect to MySQL database, we will also need usertype.core to handle the conversion between Jodatime and MySQL date. Spring dependency are pretty obvious as in earlier tutorials. Below is the Entity class for our example with Standard JPA annotations. Only special thing here is declaration of @Type which will help Hibernate easily map between jodatime LocalDate and database specific Date. ItemProcessor is Optional, and called after item read but before item write. It gives us the opportunity to perform a business logic on each item. In our case, for example, we will filter out all the items whose percentage is less than 60. So final result will only have records with percentage >= 60. Job listener is Optional and provide the opportunity to execute some business logic before job start and after job completed.For example setting up environment can be done before job and cleanup can be done after job completed. As you can see, we have setup a job with only one step. Step uses MultiResourceItemReader to read all the files matching specific pattern in a defined directory. MultiResourceItemReader then delegates individual file reading to FlatFileItemReader which reads ‘|’ seperated fields from input file. On the write side, we have used HibernateItemWriter which needs sessionFactory as property. With ItemProcessor we are filtering out the records which does not meet certain criteria(percentage > 60).jobExecutionListener can contain any arbitrary logic you might need to run before and after the job. Create a Java application to run the job. As you can see, we have read all records from all files. 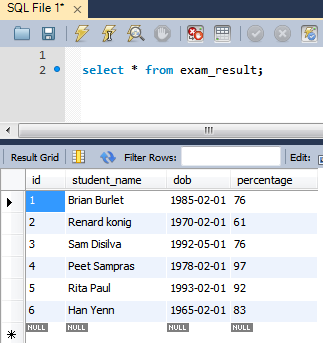 Finally, check the EXAM_RESULT table in database. Below is the snapshot from database after this job. All Records from input files who satisfied the criteria ( percentage >=60 )defined in ItemProcessor are saved successfully in database.